Continuing the theme of mechanical replacement of skill, here's an interesting physics project, a mechanical apparatus that 'juggles'...it's really a mechanism for bouncing a ball that is self-correcting. It's a fun device though. 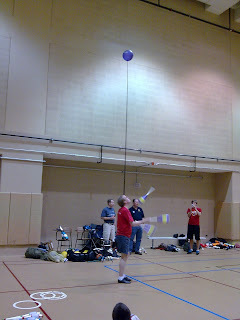 I never feel like I can explain why JuggleFest is so much fun. 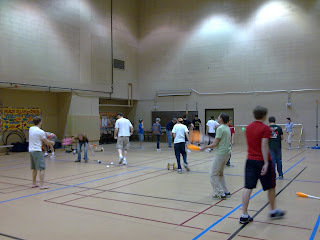 Mostly it's just a bunch of people hanging around in a big room juggling. But I got someone to show me how to do a rope spinning trick, and learned some new contact juggling tricks to try...you can hardly avoid learning new things in that environment. Jugglefest 2009, the big annual Austin juggling event, is here Friday through Sunday, on the UT campus. More info here. My "Grandpa's Juggling Trunk" show is an exploration of the props and memories found in "Grandpa's" old trunk, the relic of his world-spanning career as a juggler. From my beat-up trunk come an assortment of juggling props, each with a story that relates to Grandpa's travels around the world as a juggler. I start the show by teaching the audience how to be an Amazing Aaron audience...when to count me off, when to applaud, and especially how to shout "That's Amazing" if I should drop something. I mean, you wouldn't want me to get embarrased. This is silly and works like a charm. I now find that people I hardly know holler "That's Amazing" to me when I run into them on the street. The prop routines neatly divide the show into chunks, so I can adjust the length of the show by adding or omitting routines. 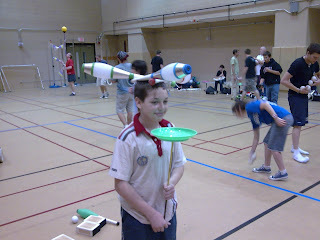 I start with a three-ball routine, and then perform the devil stick, followed by spinning plates and then clubs. 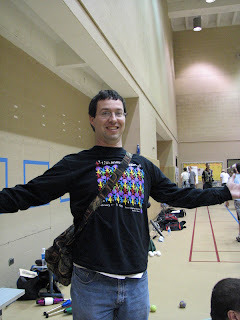 Then I may do my Dice Box routine, a four-object juggling set using large rubber dice. 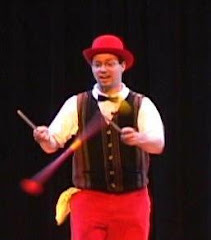 Then I do cigar boxes (hey, I've got video of that), some audience participation tricks, and finish with a balance board act...juggling clubs while spinning a plate on a stick in my mouth, all while balancing on a board on a roller. Each routine is two to three minutes long (the audience particpation takes longer), and the whole is about 30 minutes long. I'm not currently using any sound amplification or lighting, so I can show up to a site, open the box, and get started right away. Before I get started, I lay out a rope line to let the audience know where they can sit and where they can't. If you're interested in booking a show, go here. 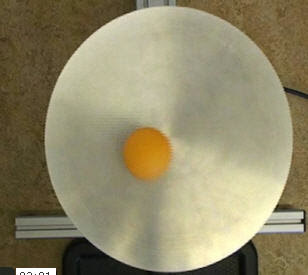 Spin a plate on a knife? I was trying to come up with knife tricks, and I thought of this one. A casual search doesn't reveal any references to it. If you've ever seen this done, spot me a comment, willya? 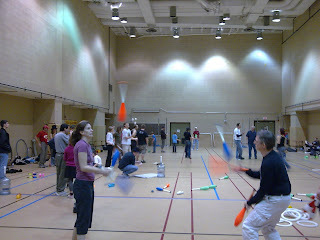 The big annual Austin juggling event, Jugglefest 2009, is coming up fast. There will be a free public show on February 21. 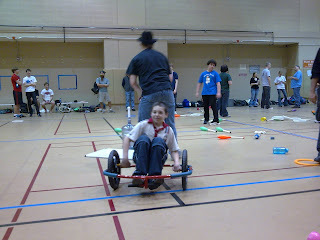 The festival itself runs the whole weekend long, on the UT campus. More info here.